Home / Articles / News / Horseware Ireland wins at the annual Louth Business Awards. Picture: Tom MacGuinness Horseware Ireland’s CEO receiving the award. Date 20th October 2018. For further information please contact Horseware Ireland on 042-9389000. 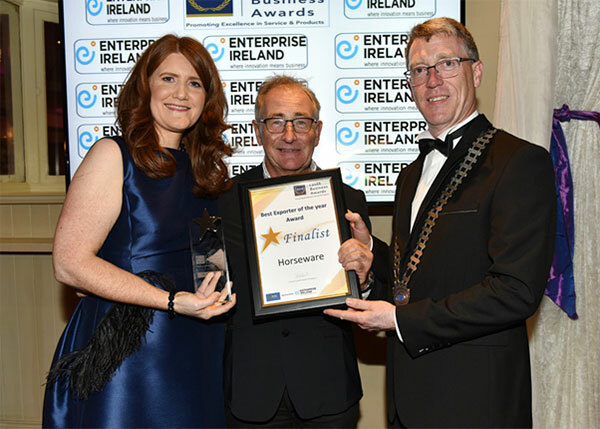 Horseware Ireland won Best Exporter of 2018, at the Dundalk Chamber of Commerce’s annual Louth Business Awards. The award category recognises the company with the highest increase in exportation over the last two years. Horseware Ireland is headquartered in Dundalk, employing 172 people across the administration and management office, production and distribution. Their premium Horseware Ireland Rambo range continues to be produced in Ireland and is exported to markets all around the world including the UK, US, Germany, France, Holland and Scandinavia. The prestigious award is now proudly on display in Horseware Ireland’s head office here in Dundalk. Congratulations to all involved.